After a number of appearances on Protestant radio and television in Nashville, Tenn., in the early 1980s, I was invited by Deacon Bill Steletemeier, the president of Eternal Word Television Network (EWTN), to be a guest on “Mother Angelica Live.” On Sadie Hawkins Day, Feb. 29, 1984, I drove down to Alabama in my $200 car wearing jeans, a flack jacket, hunting boots and a cowboy hat. I met Mother for the first time in the EWTN parking lot. Her first reaction was to hit her forehead with the palm of her hand, but I promised that I clean up real well. That first show treated the origin of the canon of Scripture, but with fun and relevance to the whole of our faith, not to mention a few jokes along the way. She saw that I could bring the hay down so the goats could get it and she invited me to make a number of television series over the decades. When she had a stroke on Sept. 11, 2001 (just hours before the plane attacks), she asked me to help her with her weekly shows; her second stroke on Christmas Eve 2001 so disabled her that I have been hosting the live shows ever since. Four aspects of Mother Angelica stand out for those who have known and loved her these many years. First is her authenticity: She was absolutely no different offstage than on. She said what she honestly thought because she believed it to be true and she did not fear that anyone might dislike her. Her only fear would be to displease the Lord Jesus. Second, the love of her life was Jesus Christ. She found the culture hollow and superficial, but the infinite source of richness in life flowed from her profound intimacy with our Lord Jesus Christ. She prayed at least four hours a day before the Blessed Sacrament, in addition to Mass and the Liturgy of the Hours. She spoke to Jesus as a friend and as the beloved spouse to whom she had given her vows as a nun. At times she was very angry at him for the severe problems she encountered; sometimes too mad to even look up at the monstrance. Yet she worked through the difficulties and returned to new depths in her relationship with him. She sought only to please Jesus, speak of him to others and bring as many as possible to share her love. Third, Mother Angelica placed incredible trust in providence. She began EWTN with $200 in the bank and put up the convent as collateral on the first loans. She followed the whispers of spiritual inspirations as they came to her and if doors shut in front of her, she trusted that the Lord would open the right door. She often said, “I have a lot of trust in our Lord; my stomach just doesn’t know it yet,” just as a last minute donation saved a project she had started. Finally, suffering permeated her whole life. Her father abandoned the family when Rita Rizzo, an only child, was two, and her mother was never mentally stable. Growing up during the Great Depression, her hard life was made more miserable in a one room apartment, often eating only crackers and salami, with rats audible inside the walls. By age 12, she drove a car to deliver the ironing her mother did for other people. She left the Catholic school when a nun mocked her for coming from a divorced family, and she hated nuns, the church and God for over 10 years. After high school (the end of her formal education), she became very ill and, at the urging of neighbors, visited a local mystic, Rhoda Wise. She experienced both physical healing and a renewal of faith and love of Christ that made the world seem hollow to her. She needed to sneak away to join the Poor Clares of Perpetual Adoration in Cleveland, leaving her mother behind, screaming down the street when she discovered Rita’s farewell letter. As a young nun, she slipped on the floor while using a large floor washing machine and became so injured that the doctors gave her only a 50/50 chance of walking again. Already aware of God’s providence, she promised if she could walk again to open a convent in the southern states in reparation for the sins of racism. Walk she did, though with a brace from her head to her feet, and she began making fishing lures to raise the money to start a convent in north central Alabama. Once she raised the money for a down payment and bought some land in Irondale, new difficulties arose. The Ku Klux Klan liked Catholics no more than blacks, so they drove by and shot up the house the sisters were using as a temporary convent. Even after they built a proper convent and chapel, a motorcycle gang attacked the place early in the morning, breaking in one door after another as the sisters kept retreating inside. A passerby noticed the motorcycles parked outside the convent and helped chase them away just before they broke down the last door. The sisters supported themselves by roasting peanuts for the Birmingham baseball park until some local official demanded kickbacks. Adamantly refusing to participate in corruption (“If I’m going to hell, it sure won’t be for a bunch of peanuts”), the sisters acquired a printing press, for which Mother wrote small books that they gave away, asking only for donations. These small spiritual works touched a lot of people, who were generous in sustaining the convent. The television network grew slowly, from four hours a day for about 2 million homes in 1981, to six hours and, in the late 1980s, 24 hours. In the early 1990s she began a Spanish channel, started shortwave radio in dozens of languages and then moved to satellite radio. 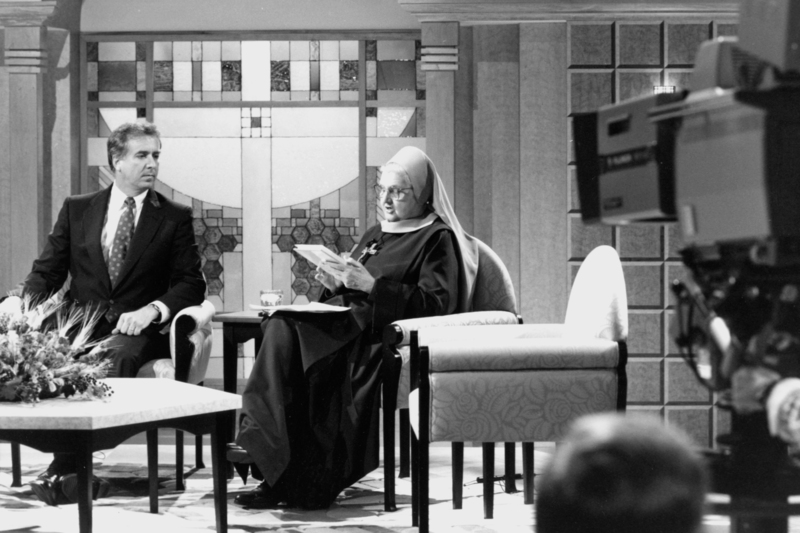 By the time of her strokes in 2001, EWTN reached 60 million homes and had 30 radio affiliates. Despite the cocksure predictions that the network would collapse in her absence, it grew more than at any time in its existence: The television station reaches 264 million homes worldwide; 500 radio affiliates operate around the globe; in addition to English and Spanish channels, there is now a German channel and a French one is beginning, particularly for Africa. The network is also broadcast in Polish, Ukrainian, Korean and other languages. The prognosticators of the network’s demise did not account for the fact that Mother’s ongoing prayers for EWTN were stronger than the weaknesses of those of us who follow in her footsteps. The history of Catholicism in the United States will need to include a section, if not a chapter, on Mother Angelica. Hardly any other woman has had so much influence, except Blessed Teresa of Calcutta. St. John Paul II once said, “Mother Angelica—she is very strong woman.” No physical pain, opposition from inside or outside the church, no overwhelming odds or threats stopped that strong woman in love with Jesus. Following her troubles with cardinals and bishops, St. John Paul personally sent her a monstrance to mark the end of the threats of interdict and other conflicts with the Roman Curia. He knew her strength came from her love of Jesus and he gave a gift to encourage the Eucharistic adoration that nourished and strengthened her. May she rest in peace. Mitch Pacwa, S.J., is a Scripture scholar and the host of "EWTN Live." I sometimes listen to the author's sermons when he celebrates the Mass on EWTN, and enjoy the historicity and fullness he brings to his homilies. He is good at his craft. I congratulate him on this article. I have recently read some very negative comments by Catholic laypersons (I doubt the hierarchy would sign their name to criticisms now that Mother is deceased) about Angelica. I was not her fondest follower, but I did respect the woman's strength in a male world. I also believe she helped some desperate people through the years. If she truly helped others, beat the bishops to technology (they can be very slow), and served the church all of her adult life, isn't that enough? Why squabble about her educational level, her so-called terseness, her "conservatism," and other petty things? Will that remove what she did as a threat to her male "superiors?" If she did God's work using her own personality, does God really expect more? I think not. Yes, anecdotal. I failed to clarify that. My first knowledge of Mother Angelica was when I lived in Birmingham. My children were little and rambunctious, so when my husband offered to keep them, I often went alone to seven o'clock Sunday Mass. In the car on my way home, I tuned into Mother Angelica to hear her first radio show. Her voice was not the usual, smooth 'radio voice,' but her words were profound, and I became a fan. Later, as a religion teacher, I ordered from Our Lady of the Angels convent in Leeds, simple illustrations that Mother's nuns drew for children accompanied by her teaching words. By then, I knew quite a few people who went to Mother for guidance concerning various trouble in their lives, and I heard first-hand how she helped them. Soon, I needed her , too. And when she came to me, it was through television. "Mother Angelica Live" on EWTN was literally a God-send. To this day, I listen to many of the re-runs, for her good, common sense, based on her sincere devotion to Jesus Christ and the Catholic Church. And most of all, her funny and fabulous courage to stand up for and against whatever she had to. May she rest in perfect peace. Too bad she never could have been ordained. She would have been a great bishop! That was a cheap shot, Luis. Mother Angelica was no revolutionary ideologue, but a faithful servant of the Lord. Much irony in the fact that she restructured the charter of EWTN so that she would not be subject to Vatican supervision. This was not a "faithful servant" of the hierarchy. But it might be argued that she was a faithful servant of the "church," since the church is the true servants of the Lord as opposed to those who corrupt the message whether bishops or others. I respect Mother for creating a Catholic presence in television and radio that has been so successful, but the finished product has the same fundamental flaw the establishment of the Church has - it teaches Catholics to be yes-men and yes-women instead of teaching them to cut their teeth on theology. Sure, they "teach" doctrine on EWTN, but without independent thought and critical-thinking, what one ends up with is indoctrination masquerading as education. James-Check the Scriptures and note the amount of times the Apostle to the Gentiles uses "slave" or "servants". Paul knew that Jesus-God come in the flesh was not some high-status cleric, but rather our mutual Creator. The Church is his body, he is the Head. In persona Christi capitus... I am assuming that you are a coreligionist, if not you may have other beliefs. Accordingly, I apologize for the assumption... in The Risen Christ, Blessed be the Holy Trinity.. Mother Angelica was an activist in the "culture wars" of the 1980s and 90s. Wow. Mother Angelica sure created much envy for an "uneducated" nun. Success, product of faithful, intelligent, hard work, seems to incense many people. May she rest in peace! This isn't about envy. Surely you can't expect everyone to share your view of Mother Angelica. I do not expect unanimity on Mother Angelica, but the tone from many of her detractors is mean spirited, holier-than-thou and, yes, envious. I don't see envy in any of the comments, certainly not mine. Ditto for mean-spirited and holier-than-thous. The charge--accurate in my view--is that Mother Angelica displayed the last two behaviors herself. Anyways, most of the comments here are laudatory. I think I have overreacted, Vince. I apologize for that. Still, if not in the forum to this article, I sense subtle disdain for Mother Angelica from comments I've read. What she achieved was nothing small, and many of those whom have not lost time criticizing could be far more dedicated laborers in the Lord's garden. But again, I apologize for my overreaction. Thanks Carlos. I've over/misstated from time to time but haven't always corrected myself so I appreciate your good example.